Very good recipe to use up day-old baguette. I used frozen spinach instead of fresh and everyone liked it. I did not enjoy the taste of this at all, I think because of the nutmeg. It also didn't come out very set. This was incredibly good. Worked perfectly well with gluten free panko and Barilla gluten free spaghetti. I thought this was pretty good but missing something. Maybe a squeeze of lemon would have helped. This makes a nice, easy, and well-seasoned meal. The chicken is tender and the sauce is delicious. You will want something—bread, rice, pasta, potatoes—to soak up all the sauce. The onion didn’t cook well, and I used prechopped which was not minced. I think I would used pre-cooked or caramelized next time. Flavor was good and it was very easy. Used a small cake pan. My potatoes were too large so I had to cook one packet afterwards. Very easy full meal in the Ipot, just needed a green to round out dinner. I was really pleased with this recipe. The turkey meatloaf was delicious and was tender and juicy. Excellent. Will certainly make this again. It would be as easy to make this on the stovetop. I had to make a number of changes including replacing cayenne with aleppo pepper, omitting the sage, and I also skipped the mysterious clove of minced garlic since I just couldn't figure out where it would go. I didn't pre-soak the beans as called for, so I decided to do a quick soak before proceeding with the recipe. I did this by cooking 1lb of beans, 8 c of water and 2 tsp salt to the pressure cooker for 2 minutes on HP, then left the house to run an errand. When I returned 30 minutes later my beans (sitting on keep warm mode) were almost completely cooked! I drained the beans and used all the beans in the recipe, along with the specified amount of their cooking liquid, and no additional salt since the bean broth already had plenty of salt. I proceeded the recipe, but only cooked for an additional 4min at HP. Turned out perfect! This had robust flavor and was a surprise hit with both kids. My roast was smaller than called for, so used less salt and sugar for the rub. I saw a criticism somewhere that their's was too salty, so this may explain why mine wasn't. Another explanation might be the length of the cure - I opted for overnight rather than the minimum 6 hours. All in all, a delicious recipe. I used a boneless pork shoulder, but otherwise followed the recipe exactly. It turned out very well, the meat was meltingly tender and the ginger scallion sauce was delicious. Incredibly easy and rich! I only made 2 servings, just to try since these must be eaten immediately after cooking. I got 2 ramekins in but it would be hard to get 3 in with 1 balanced on top, so I might need to buy another trivet for the pot. Within these pages are 75 recipes for family-friendly dishes from almost every culture: chipotle pork tacos, matzo ball soup, pesto risotto, and more. The Instant Pot is truly a world traveler. Melissa Clark, New York Times food columnist, web star, and go-to for Instant Pot recipes, now focuses on classic comfort foods with 75 all new recipes--from mac and cheese to spaghetti and meatballs, and pulled pork to shepherd's pie--that are some of her easiest and most delicious dishes ever. 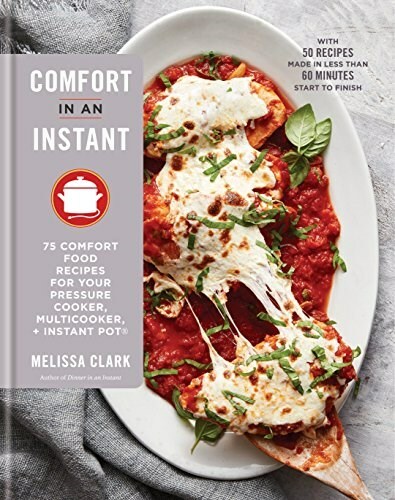 With 75 all new recipes for slow cooker, pressure cooker, and other Instant Pot® settings, Comfort in an Instant is Melissa Clark's most commercial book ever: she brings her trademark flavor-forward spin to everyone's favorite dishes- Spicy Turkey Meatloaf, Weeknight Chicken Parm, Baked Eggs and Cheese Grits, Matzo Ball Soup--and for the first time, will focus on weeknight comfort meals--recipes that not only cook quickly, but that are also a snap to prep. Recipes include dietary indications and instructions for cooking on all multi-cooker settings (Pressure Cook, Slow Cook, Saute, etc.) so busy readers can decide whether they want to have their dinner cook throughout the day, ready right when they get home, or in just a few minutes before they sit down to eat. Innovative yet practical, surprising yet approachable, Melissa's recipes are the new gold standard for flavor and quality.